The war is tearing our world apart. Instead of big armies with tanks in the field, the Vampire War is fought in the streets, neighbor against neighbor, family against family. Anyone can turn at any time. The blood hunger can suddenly appear in the middle of a kiss. The person who sleeps next to you every night could wake up in the dead of night ... hungry. So hungry. 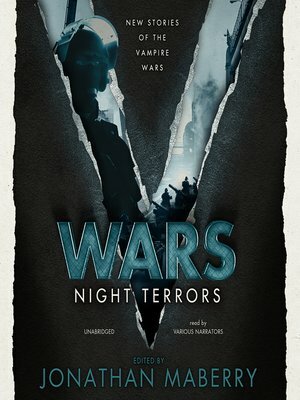 V Wars: Night Terrors collects all-new stories from the reporters embedded with the beats (humans) and the bloods (vampires). Each tale explores the nature of terror and peels back another layer of our comfort. Each tale bares our throat to the bite. New York Times bestselling author Jonathan Maberry and his team of front-line storytellers bring you all-new tales of horror and heroism, of pain and delight, of deadly despair and soaring courage. The war between beats and bloods is blazing. Pick a side. Jeremy Robinson is a bestselling author of adventure and science fiction novels. He also writes horror novels under the name Jeremy Bishop. He lives in New Hampshire with his wife and three children.